Highest quality housing at the most cost effective price. Build-A-Box Homes vision exists to stimulate the housing and workspace market by providing enterprises and individual homebuyers with apartment complexes, homes purchased in bulk, individual homes, office buildings, and storage with the highest quality possible at the most cost effective price. The Build-A-Box Homes vision to stimulate the housing and workspace market by providing enterprises and individual homebuyers with apartment complexes, homes purchased in bulk, individual homes, office buildings, and storage with the highest quality possible at the most cost effective begins in the 5th Ward of Houston, TX through the establishment of a 50-unit apartment complex constructed out of shipping containers. This 50-unit apartment complex will create jobs, raise the economic ceiling of the community, and improve the overall quality of life for the residents of the 5th Ward. 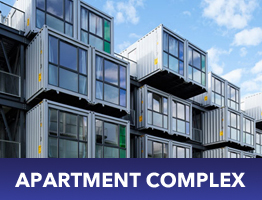 Build-A-Box apartments, homes purchased in bulk, individual homes, office buildings, and storage will then be shipped around the nation and the earth to further build communities and the market place. The Build-A-Box Homes for-profit corporation is committed to the designation of philanthropic funds to non-profit corporations that share a common mission to improve the economic climate and improve the overall quality of human life and the market place environment.